Join Max and Molly as They Explore God's Book! This high-quality DVD, adapted from the popular book, "How to Study Your Bible for Kids", gives children aged 8 to 12 the tools they need to study the Bible for themselves. The video uses an entertaining mix of live action and animation to introduce the key concepts of inductive Bible study - observation, interpretation, and application. As kids join the adventures of Max and Molly of the M and M Detective Agency, they'll get excited about studying the Bible for themselves and discover that God's Word speaks to them right where they are. Intended for personal use, and for home school and Sunday school classes. How To Study Your Bible For Kids Dvd by Janna Arndt; Kay Arthur was published by Harvest House in July 2009 and is our 24355th best seller. 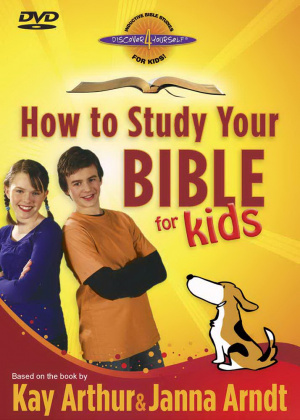 The ISBN for How To Study Your Bible For Kids Dvd is 9780736926119. Be the first to review How To Study Your Bible For Kids Dvd! Got a question? No problem! Just click here to ask us about How To Study Your Bible For Kids Dvd.